I've played Shipyard (2009) about a half dozen times and find it to be a complex but enjoyable game. There are a lot of working parts in the game and not all of them are pulling in the same directions, like several machines sitting side by side, open to the eye, all necessary to the manufacturing plant, but needing different kinds of expertise to make it perform at top efficiency. So, the massaging of the various Shipyard mechanics needs to happen in concert but requires a level of multitasking to lead to victory. We’re in 19th century, sea transport is more and more important. Both corporations and naval forces require newer and newer ships. Try to put yourself in the role of their manufacturers. Hire employees, buy accessories, get favour of evaluating committees. Don’t forget to rent a canal and you can heave anchor. Players take turns, beginning with a randomly selected player and continuing around the table clockwise. On their turn, they will choose one of the available actions from the Action Track. The action will get the player something they need to help build their ships. On the player's next turn, they will move that Action Card ahead of all the others and choose a different action. If a player completes a ship on their turn (ships consists of little cards depicting bows, sterns, and (preferably several) middle pieces with several options to add equipment or crew), it is taken out for a shakedown cruise in a canal, during which they may score points for speed, crew, equipment, or safety. As players take their turns, the line of Action Cards will advance around the Action Track. When the lead Action Card reaches the Starting Space again, the countdown marker moves down one space, and play continues. The game ends when the countdown marker reaches the finish space. (It can also end early if the players run out of Ship Cards.) Bonus points are scored for Government Contracts, and the player with the most points wins. 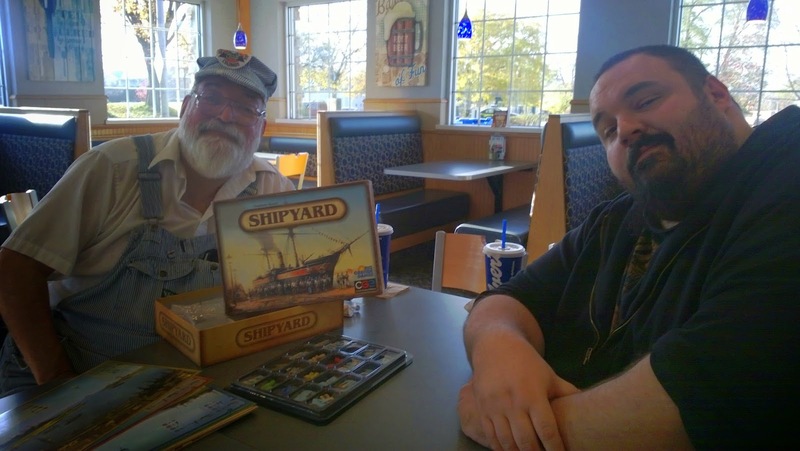 It's not a long game, taking under two hours for a few players, and that's part of the charm and frustration of Shipyard. While you will be pleased with your successes, it's one of those games where you always will feel you could have improved your management, even when you win. This is a keeper game for folks who like complexity and replayability in a base game that I don't think needs any expansions. There is but one modification we've made to this game, and it seems to be a near-universal one, in that there is a ship building contract in the game, a hidden victory point mechanic, and we treat it as if the number "32" simply is not on it. I think some folks pull the whole contract from play be we find this more moderate adjustment to be plenty enough.